Alan Duff has a go at Tuku Morgan, his greed and lack of a "self-regulation" button. He proceeds onto the lack of Treaty money spent on creating employment and helping "flax roots Maori." Then he takes an interesting turn. You live overseas for a few years and come to realise it's quite an advantage being part-Maori. There's the musical side, and when you get a group of Maori and a guitar or two, it is quite a neat feeling all singing together at least knowing you're in tune and by French musical standards pretty damn good. Just being an expat Kiwi feels great - our friendliness, our love of rugby, the people we know in common. By French drinking standards, we're a bit thirstier and definitely rowdier. However, we have all embraced the behavioural code here. But I believe being a Maori in Enzed is a more negative experience. All that compulsion to live by the myth of whanau, hapu and iwi. Ask many Maori who have moved to Australia; they'll tell you living as an individual is infinitely better. If I was a benign dictator I'd pack every Maori off out of the country so they could realise what a wonderful thing it can be to be Maori and Kiwi and individualistic at the same time. Many of our Maori leaders have to invest in this potential and step away from the Champagne tap. How many second chances when children involved? The NZCPR has an expanded version of my earlier blog post as their guest commentary this week. 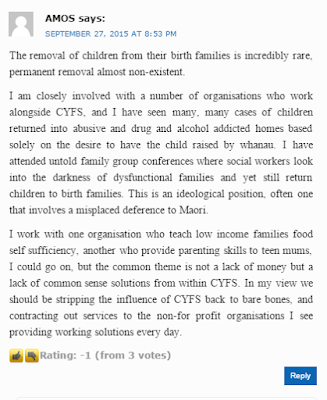 "New Zealand (as represented by the child protection authority and its practices) is currently officially anti-adoption. The anti-adoption groundswell that built over the nineteen seventies and eighties grew out of an abhorrence of the past removal of babies from unmarried mothers. Today most feel repugnance for the practice. But isn’t wholesale shunning of adoption an over-reaction? There are many instances whereby newborns go directly into the care of CYF. The prospects for these children are bleak yet their rights seem trumped by the rights accorded to their birth parent and extended family. Babies aren’t simply removed from mothers by dint of being ‘illegitimate’. These babies are removed because their mothers are criminal; are incarcerated or live on the streets; have abused prior siblings and pose a serious threat to their newborn. The principle of redemption or second chances is all well and good when offered to the adult individual. But how many times should a child be exposed to known risks in order to satisfy liberal impulse? Children’s lives shouldn’t be gambled with. And they needn’t be if we once more considered adoption." "It is an unfortunate fact of life that at the heart of the child abuse crisis are government incentives for women to have children they are ill-equipped to provide for. Until the State stops paying women to have babies, children will continue to suffer. The State is no substitute for a loving mum and dad, and no role model for a child. In fact it’s a tragedy that idealists have exerted such influence on policy and brought us to the systemic failure we have today. The child abuse crisis is a national disgrace. Only the State could fail children on such a monumental scale. Anyone concerned should read the Expert Panel’s report. It helps to explain why, in spite of the very best efforts of those who are trying to help, the child abuse crisis continues unabated." I frequently use my blog as a filing system. While I don't use 'labels', running a 'search' for what I want inevitably leads to success. So the reason for this post is primarily to record a new fact - new to me anyway. 60 per cent of all rentals in New Zealand are subsidised by the Government. Six out of ten rented homes are subsidised by the taxpayer. I am old enough to remember the mid-1980s. After leaving university, I was involved in farming. At that time we had a number of arrangements in New Zealand that meant people who were involved in farming weren’t getting the right price signals. Then, suddenly, they did. I was a part of communities that were drastically affected by that. Farm subsidy systems were abruptly removed. Our communities changed drastically and dramatically.That was a sharp personal lesson, and one that many New Zealanders also experienced. Yet the rental property market is still heavily subsidised and still not working. 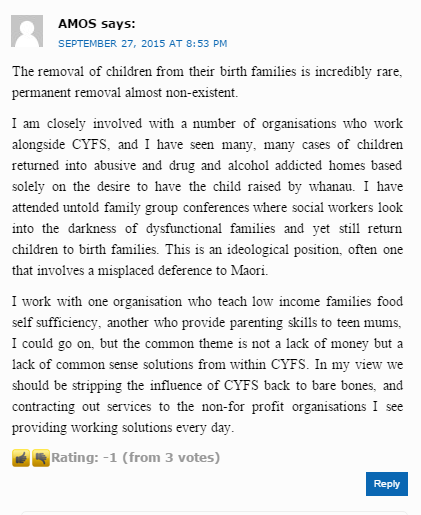 Yesterday I was on Larry William's show backing Anne Tolley's call for contraceptive intervention with mothers who have children already earmarked for removal by CYF at birth. I pointed out that many of these children will be damaged in utero by their mother's alcohol or drug addiction. This morning's NZ Herald features the heart-breaking story of exactly the sort of child who is being failed first and foremost by his mother and father, but secondly, by CYF, who are tasked with the care and protection of children. The only saving grace in this awful story is that one social worker recognised the mother's use of her child as "a cash cow".That's the next issue that needs open and honest debate (if an honest debate can be had about a dishonest practice). The use of children as meal-tickets. It disgusts me. A severely disabled child was used as a "cash cow" by his alcoholic mother and her boyfriend to access up to $80,000 in benefits, according to notes in a Child, Youth and Family file. In it, a social worker said of the boy's caregivers: "It would appear that it's more about receiving financial payment from Government agencies, than actually providing a home for Benjamin*." The Minister for Social Development wants to find a way of stopping the most at-risk beneficiaries from having more children. Unfortunately Tolley is being somewhat timid. Every year, one in five children born will be benefit-dependent by the end of it. In the 6 months to March 31, 2015, 6,347 babies were added to an existing benefit. In that context Tolley's ambition looks lacking. But still upsetting for some. Association of Social Workers chief executive Lucy Sandford-Reed said she felt uncomfortable about the minister's comments. There's a big part of the problem. A denier. Head of the Social Worker's union no less. She should be applauding the Minister for at least having the gumption to publicly ask why some women keep having babies when they are incapable of providing for them or worse. "...stripping the influence of CYFS back to bare bones..."